For the sake of time, I’ll just paste the release. Pricing for the iPhone 3G is based on a 2-year contract. Woohoo. Unlimited data plans for iPhone 3G customers will be $30/month while business users will have to pony up $45/month. Also, revenue sharing has ceased going forward between Apple and AT&T. Update: Scoot on over to CrunchGear for all the updates and answers to your questions. SAN ANTONIO, June 9, 2008 — AT&T Inc. (NYSE:T) today announced it will be the exclusive U.S. provider of the new iPhone 3G, details of which were outlined earlier today at Apple’s Worldwide Developers Conference in San Francisco. · 3G broadband wireless connectivity, which gives customers a home broadband-like speed experience when surfing the Internet, sharing files and using media-rich Web applications. · Business-class capabilities, including e-mail, viewed on a large, touch-screen device and designed to meet the needs of companies of all sizes. · The ability for developers, including AT&T, to create customized consumer and business applications using the Apple software developer’s kit (SDK). Customers can get more information on iPhone 3G at www.att.com/iphone. AT&T expects that iPhone 3G’s attractive pricing and rich set of features including business e-mail and other applications, combined with the broadband speeds of AT&T’s 3G network, will spur significant subscriber and revenue growth — particularly in wireless data — and strengthen AT&T’s wireless leadership and long-term growth profile. AT&T will sell iPhone 3G in more than 2,200 company-owned retail stores and kiosks, as well as through its direct business sales teams. The new agreement between Apple and AT&T eliminates the revenue-sharing model under which AT&T shared a portion of monthly service revenue with Apple. Under the revised agreement, which is consistent with traditional equipment manufacturer-carrier arrangements, there is no revenue sharing and both iPhone 3G models will be offered at attractive prices to broaden the market potential and accelerate subscriber volumes. The phones will be offered with a two-year contract and attractive data plans that are similar to those offered for other smartphones and PDAs. AT&T anticipates that these offers will drive increased sales volumes and revenues among high-quality, data-centric customers. Currently, less than 20 percent of AT&T’s postpaid subscribers have integrated devices capable of voice, Web and data applications. Based on the company’s experience, average monthly revenues per iPhone subscriber are nearly double the average of the company’s overall subscriber base. n With a two-year contract, the price of an 8GB iPhone 3G will be $199; the 16GB model will be priced at $299. n Unlimited iPhone 3G data plans for consumers will be available for $30 a month, in addition to voice plans starting at $39.99 a month. n Unlimited 3G data plans for business users will be available for $45 a month, in addition to a voice plan. In the near term, AT&T anticipates that the new agreement will likely result in some pressure on margins and earnings, reflecting the costs of subsidized device pricing, which, in turn, is expected to drive increased subscriber volumes. The company anticipates potential dilution to earnings per share (EPS) from this initiative in the $0.10 to $0.12 range this year and next, with a 2008 adjusted consolidated operating income margin of approximately 24 percent and a full-year 2008 wireless OIBDA margin in the 39-40 percent range. As recurring revenue streams build without any further revenue sharing required, AT&T expects the initiative to turn accretive in 2010.
iPhone 3G harnesses the power of AT&T’s broad and powerful 3G mobile broadband network, which offers 3G mobile phones download speeds of up to 1.4 Mbps. AT&T’s 3G network is currently available in 280 leading U.S. metropolitan areas; by year-end, the company plans to offer 3G service in nearly 350 metro areas. Following the recent turndown of its TDMA network, the company is further enhancing its 3G network, with improved coverage quality made available through reallocated 850 MHz spectrum. AT&T’s 3G network is the best positioned among American carriers to grow in line with customer demand, evolving to next-generation speeds incrementally during the next few years. Between 2005 and the end of 2008, AT&T will have invested more than $20 billion in wireless network improvements and upgrades. AT&T has the best global coverage of any provider, with voice-roaming available in more than 200 countries and data-roaming in more than 145 countries, including more 3G roaming than any other carrier. 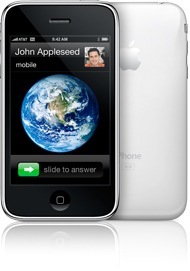 In addition, the new iPhone 3G will operate in Wi-Fi mode through wireless modems in homes and offices, as well as public hot spots. iPhone 3G includes new business capabilities, including access to corporate e-mail and intranets, as well as the ability to certify mobile business applications to suit the needs of an array of industries, ranging from health care and real estate to higher education and financial services. Starting July 11, AT&T will begin marketing to its business customers, which includes all of the Fortune 1000. To prepare for the rollout, AT&T will be conducting extensive training among its thousands of enterprise and small business sales force and customer-support employees. AT&T is the world’s leading provider of corporate wireless e-mail solutions. Through its work over the years with the developer community, AT&T has developed a robust catalog of hundreds of enterprise applications (www.att.com/choice). AT&T will work with Apple, using the SDK process, to enable many of these applications, which today operate on other AT&T-powered wireless devices, to also work on the iPhone. The growth of mobile applications represents a huge opportunity for companies to improve productivity through reduced overhead expenses, access to real-time information and higher levels of speed and efficiency. AT&T is working closely with Apple to roll out several new and innovative applications that take advantage of the iPhone’s advanced capabilities. For example, AT&T is finalizing YELLOWPAGES.COM mobile for the iPhone, an innovative GPS-enabled application that combines local search with social networking capabilities, giving users the ability to search for information, share reviews and plan activities with friends, neighbors and co-workers. In addition, the company will work to certify many of its existing mobile applications for businesses, created in conjunction with third-party developers, for use on the iPhone.